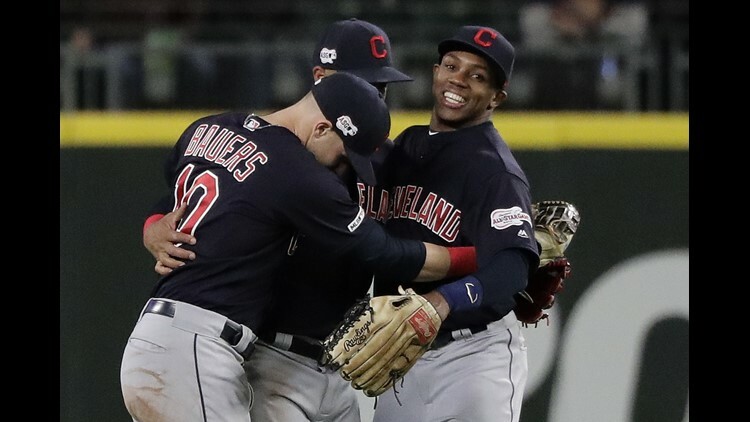 Cleveland Indians outfielders, from left, Jake Bauers, Leonys Martin, and Greg Allen, right, celebrate at the end of the ninth inning after the Indians defeated the Mariners 4-2 in a baseball game Tuesday, April 16, 2019, in Seattle. Bieber matched his season total with three walks, but improved to 9-0 on the road in his career. SEATTLE (AP) - Shane Bieber struck out five and combined with three relievers to hold Seattle to six hits as the Cleveland Indians beat the Mariners 4-2 Tuesday night and stretched their winning streak to three games.